See how easy it is to make amazing potato gnocchi. Bring a large pot of salted water to a boil. Peel potatoes and add to pot. Cook until tender but still firm, about 15 minutes. Drain, cool and mash with a fork or potato masher. Combine 1 cup mashed potato, flour and egg in a large bowl. Knead until dough forms a ball. Shape small portions of the dough into long "snakes". On a floured surface, cut snakes into half-inch pieces. Bring a large pot of lightly salted water to a boil. 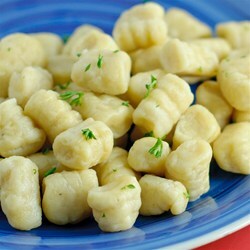 Drop in gnocchi and cook for 3 to 5 minutes or until gnocchi have risen to the top; drain and serve.